Just about to install my rear dynamo light. But first i want to know what is the best way to run the cable from the front to the back. The light fits on the mud guard. Two wires - don't rely on any metal parts of the bike for conductors, cable ties electrical tape and patience. If you want to do a neat job, SJS do the rubberised coaxial cable used by Schmidt, which is much nicer than traditional figure-of-eight bell wire. Cable routing - I went for under the down tube, because that way it doesn't get in the way when you pick the bike up or hang it on a stand by the top tube. If you can get thicker than usual insulating tape, that can work for running cable neatly along mudguards. Retroreflective tape will also work. Regular insulating tape is a bit thin. I second what aidan.f says about running two wires. Bear in mind that many lights are still designed to work with one-wire systems and will connect one terminal to the frame - this means you have to pay attention to the polarity when running a two-wire system, otherwise it shorts out the dynamo. I consider 2 wires to be essential. The alternative doesn't fail often, but the failures are never at a convenient time. I routed my cable (1) under the down tube, (2) along left chainstay & (3) along mudguard stay. Fixing methods were (1) patches of sticky tape, plus the odd cable tie, (2) 100% cover with strips of Sylglas tape which is initially transparent, but looks dirty after a few years. Mine has suffered mechanical damage (or failed without external assistance, which seems unlikely, given its intended usage), but the bell wire has survived. (3) spiral wrapping, intended AIUI to wrap bundles of wires. The smallest size from Maplin, works well along a mudguard stay. It's fiddly to install, but looks reasonably neat & offers a fair amount of protection from mechanical damage. It'd be a bit of a pain to redo if e.g. the stays had to be replaced. I'm not convinced about the virtues of co-ax vs bell wire. The wiring is vulnerable to mechanical damage & assorted causes of high temperature . IMHO bell wire is likely to be more tolerant of both, given that the worst case is failure of insulation between the conductors, which disables the front light IME. Which rear light are you using? I'm convinced that mounting on the mudguard is by far the best option for visibility, but have been disappointed with the optics of what I've bought. The benefit of the Schmidt coaxial cable isn't really due to being coaxial - that simply makes it easier to install, as you don't have to wind all the twists out of it to make it look neat - it's because it has a highly flexible insulation (silicone or something maybe?) that is kink-free and much more complaint than the usual PVC. I reckon it would last much longer when subject to repeated flexing (eg. at the fork:frame interface) than bell wire, though if you're sensible about curve radius I'm sure anything will out-live the lights. Not that it really matters for lighting. I've got the Schmidt stuff on two bikes and standard B&M bell wire on the other. Both work fine. But if you're wire shopping anyway and want it to look neat, it's a good choice. If you're attaching temporary electrical equipment (eg. battery chargers) to a bicycle, the extra flexibility of the Schmidt stuff really comes into its own, as it's much less tangly and disinclined to wander into moving parts when loosely wrapped around tubes. I still believe that co-axial cable is more vulnerable than bell wire in the environments in which I use my bike. I have had no problems with tangling, and TBH am not very fussed about appearences. I don't know what caused the damage to the tape on my chainstay, but am thankful that it didn't penetrate the insulation of the wires. Nevertheless it doesn't need a lot of imagination to recognise that there is a potential risk to the whole lighting system. The failure that actually occurred seems to have been due to a breakdown of insulation between the 2 cores of bell wire. It's not unequivocal, since diagnostic analysis showed that the problem went away if anything was changed. I suspect that my problems are atypical. I route my cables to avoid mechanical damage in normal use, including luggage rubbing, the bike leaning on things or falling over (the exception being car carriers and the like, which clamp things in unusual places). It's certainly worth taking a longer cable route to do this. I've never had a problem with high temperatures on a bike Some sort of fettling or car exhaust when on a carrier, I'm guessing? Unless you've got a rocket powered bike? I don't think coax is going to be any *worse* than bell wire for mechanical damage, for the simple reason that the inner layer of insulation is protected from abrasion by the outer braid of wire. Minor damage will only expose one conductor, rather than two. Major damage is going to wreck anything that's not properly armoured, anyway. I expect the silicone is slightly more resistant to heat, too. Not that it matters, as none of this stuff is going to happen as you're riding along; you'll soon notice if the lights aren't working after a crash or clamping the bike in a workstand. Random failures happen at connectors. For the avoidance of doubt that wasn't what I was suggesting at all. More like inside chainstays and under the downtube, rather than twisted around the tubes where they're exposed on all sides, for example. Some mudguards incorporate foil strips that can be used to connect a dynamo light. Looks neat, but it adds another set of connections to worry about - in a particularly corrosive place. The suspected cause was fettling. Several months before the failure I had to use a hot air gun to reshape the bottom of the rear mudguard back to where it used to be before assorted train journeys had squashed it too near to the tyre, which obviously also affected the elevation of the beam from the light. Naively I thought that the spiral wrapping would provide enough protection for the wires if I was careful enough about where the hot air went. All was working OK at the time. Fortunately the lights quit when I was fairly close to home (end of Sept.) so the emergency back-up system was adequate. On reflection the experience doesn't make a good case for the bell-wire, which came with B & M lights. The Schmidt product seems to be technically better. so if i buy my new spa touring frameset in the next month or so is it wise to drill holes in the frame so as i can hide the dynamo inside the frame. For a mudguard light Down the down tube along the non chain stay then up the mudguard wire to the lamp. The tidiest I did this was when I had a Rholoff. The cable was spiralled along the shifter cable for most of its journey. For rack lights Along the top tube and below the rack. There are usually convenient features on racks to attach ties to. I have thought of having Argos drill the tube and fitting a couple of grommits to conceal the cable on the top tube. So far I have not bothered. Depends on how you feel about warranties, with particular reference to not having one due to self-inflicted frame vivisection. As for routing, for the rack-mounted light I fitted on my long-distance mountain bike I routed the cable along one side of the rack (its there to support my seatpack and/or somewhere to bungee a water bladder - I have no plans to use panniers) and then along the hose for the rear brake - nothing fancy to attach the cable, just a couple of zip-ties on the cross-members of the rack and a couple more where the brake hose is zip-tied to the frame. A little bit of insulating tape was used at strategic points to stop the lighting cable flapping around too much. Obviously this isn't going to work if you're not running hydraulic brakes or a similarly fully enclosed cable system, but the end result is very neat, but then it does help that the headlight I'm using (Supernova E3 Triple) has a flying lead out of the main body for connecting a tail light. Trying to get rid of my belly... and failing! I just spiral the cable along the top tube to the seat stay then (for me) along the underside of the rack. This means I can take in any slack and maintain a tight fitting cable which won't catch on anything. Also has the advantage that there is spare cable if I have to trim the ends due to corrosion. @DaveCrampton < wot a twit. Heatshrink and insulating tape. I've run my rear light cable alongside my brake cable housing with heatshink and then taped the middle section to the top tube with insulating tape. The aero advantage is probably negligible , but it looks a lot neater than when it was all taped. On a touring bike, how about into the down tube via a (rarely used anyway) underslung bottle boss, then up the seat tube and through the top of the seatpost, assuming you find one with a hollow top? It may even be worth buying a plain post and Brompton Pentacip for the purpose. 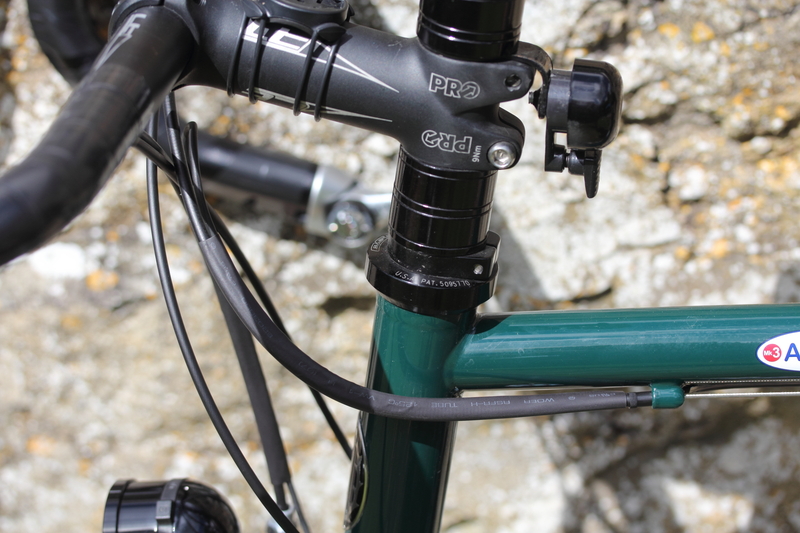 Then it can go down the back of the seatpost and along the underside of the rear rack to a rack-mounted light? Obviously you have to take the BB out to do the job. My replacement frame came with cable guides for full length cables. Since I went disc brake the top tube cable guide was empty. I run the dynamo wire through the cable guides. Then just some discrete cable ties on the rack itself. Hidden under the rack pack anyway. Page created in 0.098 seconds with 26 queries.